This sedan is for new Bentley customers who want performance and style, but need the accommodations and convenience of a 4-door. Positioned above the S-Class Mercedes-Benz, the Flying Spur is far more exclusive. A 6.0L W-12 and AWD ensures that this Bentley can forge through the worst weather in speed and comfort. The standard air suspension keeps the Bentley level regardless of load, as well as adjusts ride height automatically. 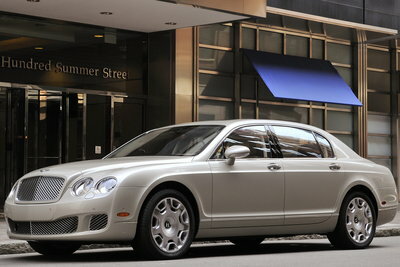 With a curb weight well over 2.5 tons; this Bentley is as heavy as some full size SUVs. Despite its conservative styling, the Flying Spur has a top speed of 195 MPH, which makes it one of the fastest sedans on the planet. The 2009 Flying Spur features updated front-end styling. A high-performance Flying Spur Speed model joins the lineup.